The internet has some pitches for the Obamas. Netflix announced a multi-year deal with President Barack Obama and his wife Michelle on Monday. The two will act as producers for an upcoming series or film, but no specifics have been made available although plenty of people have some potentially great ideas. When the streaming service made the announcement about the deal with the Obamas, those people who were not a fan of the former President proudly tweeted about how they’re canceling their Netflix account. 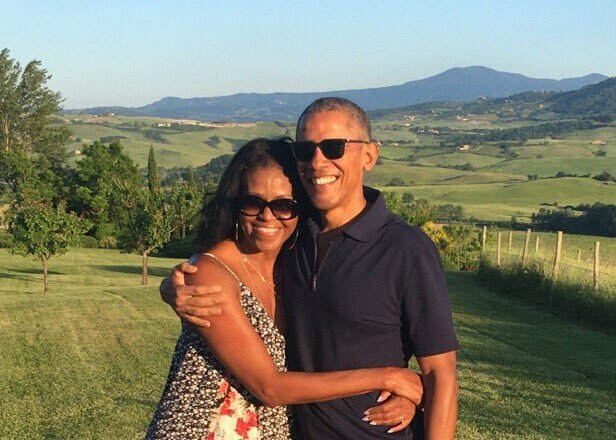 On the other hand, admirers of the Obamas shared their excitement over social media and offered some ideas of what shows they’d want to see, ideally featuring the former first couple. BARACK OBAMA: What if instead of a banana stand, we say there’s always money in affordable health insurance? OBAMA: Michael, instead of loving Alia’s character, maybe you encourage Maeby to go out and vote. Hopefully, President Obama is a fan so he can keep it around for another season. The Office, but instead of a paper company they make a comedic tv show, and instead of Steve Carell as Michael Scott, Barack Obama as himself. Does this mean Ricky Gervais would get a piece of another show? Surely no one would have a problem with this. Unlike Alexander Hamilton, President Obama won’t have to wait 200 years for have his own musical. Will it be serious like Making a Murderer or fun like The Toys That Made Us? I demand a show based on that SNL skit "The Rock Obama." You wouldn’t like him angry. A little wardrobe advice couldn’t hurt. Although President Obama would probably enjoy having NBA players hanging around the house. 7. Happy Obama? The Water President? It doesn’t matter because Adam Sandler’s fans will watch it a dozen times. Obama Netflix show idea: random Americans just cry into their laps about the current state of the world as they console them. Pilot episode features me. Or maybe more like the Oprah Show. Can I suggest "Thanks, Obama" - a show where he goes around surprising people with charitable deeds. It’s like My Name is Earl, but instead, he didn’t do anything wrong in the first place. In case he wants more cameras to follow his every move. The President can be her Watcher. Will the President curse as much as Samuel L. Jackson? Show where Obama and Biden solve mysteries please. This could go different ways. Maybe this is a little like X-Files or like an Scooby-Doo series.